All for Love, B420, Blossom Again, Don't Look Back, Digital Shorts by Three Filmmakers, Familia, The First on the Moon, Haze, Heavenly Path, If You Were Me 3, Inner Circle Line, Magicians, The Masseur, Mrs., Offside, Princess Aurora, Reason, Debate and a Story, Riding Alone for Thousands of Miles, Romance, A Spring for the Thirsty, Who's Camus Anyway? 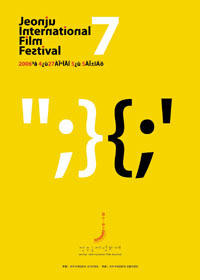 The Jeonju International Film Festival (JIFF) had its 7th edition this year between Abril 27th and May 5th. The city of Jeonju, famous for the production of paper and by its gastronomy, is the capital of Jeollabuk-do (North Jeolla Province), and is situated 250 Km south of Seoul. The festival has been growing in the last few years, redefining the scope of some of its sections, but always focusing on independent film. 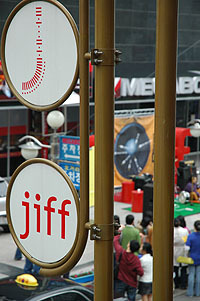 Usually referred to as the 3rd biggest film festival in Korea, the JIFF was recently called on a Variety article, signed by Darcy Paquet, the most important film event in the country after the PIFF, in Busan, changing places with the Bucheon International Fantasy Film Festival (PiFan), which faced a serious crisis on the previous year. The JIFF selection is made up of two main sections: Indie Vision — films from new directors, first or second features — and Digital Spectrum — dedicated to works that used the digital media to open "undiscovered aesthetic grounds" in the art of filmmaking. Each of these two sections included twelve films from Asia, Europe and the Americas. 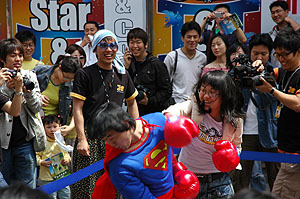 The activities on the main street of the Cinema District included beating up Superman. Outdoor screening and JIFF Center. 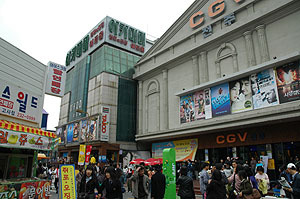 Academy and CGV, two of the festival theatres, in front of the JIFF Center. The inside of one of the Megabox screening rooms. Seven out of the ten multiplex screens were used by the festival. One of the festival's highlights is the project Digital Short Films by Three Filmmakers, which exists since the first edition of the JIFF. The festival commissions short films by three Asian directors which are invited to create a film with around 30 minutes, later premiered in Jeonju. This works have been afterwards shown in other film festivals and this year it was announced that the Locarno Film Festival intended to hold a retrospective with all the digital shorts made since the beginning of the project. The Jeonju Film Festival allows the visitor to chose from a wide range of films, beyond the independent/arthouse features that compose it's main sections. Cinemascape had a number of works reflecting the tendencies of international cinema, from Magic Mirror, by Manoel de Oliveira, to House of Bugs, by Kurosawa Kiyoshi, passing by Homecoming, the "Masters of Horror" TV episode directed by Joe Dante. This section also included shorts, arranged thematically in four showings, where the Portuguese film Tragic Story with Happy Ending by Regina Pessoa was included. The 10 minute short would later win the main prize at the Seoul Cartoon & Animation International Festival (SICAF). There was another Portuguese film at the JIFF: Douro, Faina Fluvial (1931) by Oliveira, on a showing under the title Labor: Past and Present. 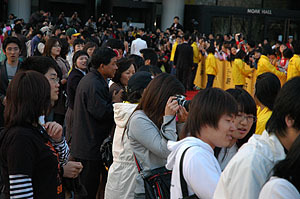 Korean cinema had a special focus, in two sections: Korean Cinema on the Move (independent films) and Korean Cinema Showcase (mainstream films), besides several screenings with short films. In what concerns retrospectives, this year the choices felt on the cinema of Indian director Ritwik Ghatak and Forbidden Films of the Soviet Union (Russia, Ucrania, Georgia and Turkmenistan). In the first days of the festival there were three Midnight Obsessions — all-night screenings with three or four films. The obsessions comprised David Cronenberg: The Early History of Violence (with four early films from the Canadian director), The Music Lovers (three films related with music: 20 Centimetres, Brothers of the Head and Habana Blues) and In the Mouth of Madness (The Piano Tuner of Earthquakes, Lunacy, from Czech filmmaker Jan Svankmajer) and Rampo Noir (Japanese horror in episodes). On a parking lot converted in festival reception area, a big screen was installed for a few free outdoor screenings. 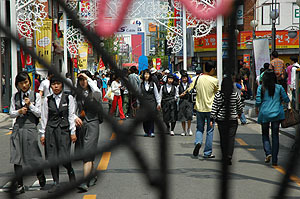 The films were of recent production and most of them Korean. The exceptions were Oliver Twist (United Kingdom), Initial D (Hong Kong) and La Maison de Himiko (Japan). Korean films were English subtitled, the foreign ones had Korean subtitles only. During the festival there were some seminars and two actor masterclasses; one with Choi Min-sik and the other one with Takenaka Naoko, from Japan. The schedules occupied most of the day and included the projection of one film (Failan, with Choi, and Sayonara Color, with Takenaka). On this first visit to a Korean film festival, we couldn't avoid mentioning its specific characteristics and in what way it differs from the European festivals we have been getting to know during the last few years. Theatres. The JIFF used fourteen screens, among which the huge Sori Arts Center was only used for the opening and closing ceremonies. 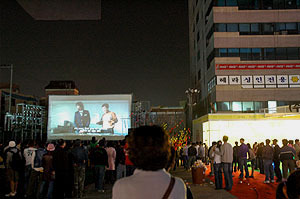 The Cultural Center of the Chonbuk National University had a limited number of screenings besides the Midnight Obsessions. Guides on the toilet. 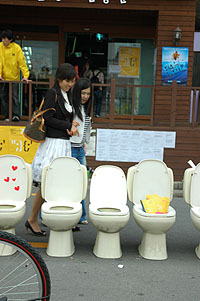 The festival used unconventional ways for promotion. The multiplex Megabox was the projection core of the festival, with seven of its ten screens being used (the brand Megabox was one of the main sponsors of the festival). 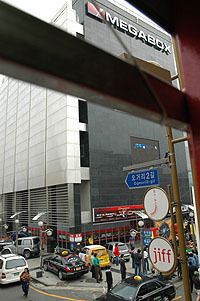 The other screens were very near, part of an area known as Cinema Street or District: CGV 4, Academy Art Hall 2, Jeonju Cinema 1 e Primus 2. All screening rooms had good technical conditions, even those situated in older buildings. To go to the Sori Arts Center or Chonbuk University one would have to get a bus or a taxi, but in my case it was only necessary to leave the Cinema District for the opening. Audience. Korean audiences might be the best in the world for those of us that would like to watch a film without continuous interferences all around. Most projections took place in absolute silence, apart the (rare) instances of cell phones ringing or (less rare) lighting up in the darkness. The screenings would follow after a filmed introduction with the two public relation ambassadors of the festival, where it was asked for mobile phones to be turned off and for cameras and food and drink to be left at the entrance (that didn't necessarily happened, but I never heard anyone crunching or schlurping near). They also added something like, "You might know that the film is until the end credits, please keep on you seat with a round of applause until the lights are turned on." For most of the festival's audience, it's normal to watch the credits until the very end, even when they're on a foreign language. I still haven't checked how that would be on a commercial screening, but I heard mainstream audience aren't that patient, being more similar to the ones I know from Europe, with a spring coming loose on their behinds at the moment music fades in and the image fades out. Silence is a rule but that doesn't mean the public hadn't any sort of reaction to the films, more or less intensively, according to the action on screen. The way a lot of people reacted to tense scenes with loud "oohs", when someone was about to fall from the top of a building, for instance, reflects a great focusing on the screened work to which we are not very used to, in a context of mass behaviour. Another characteristic of the audience is the fact that it's mostly made of teenagers. The fact they're very young doesn't prevent them of having interest and curiosity for all genres of films, home made and foreign, being a Korean blockbuster or a 60's Russian film. After a few screenings there would be Q&As with directors and actors and the young audience shown a huge interest and attention regarding the film they've seen, coming up with quite pertinent questions related to the themes or techniques used. Street Performances. Besides the films, there was a lot of activity around the theatres were the festival took place, with music shows and other street performances, besides bigger concerts on the stage of the outdoor screening. Korean bands played there, like Fortune Cookie, 3rd Line Butterfly and Sogyumo Acacia Band, but also Japanese and even a Brazilian one. Organization, Guide and Catalogue. The process to select films and get tickets is made easy by a good organization of the festival's publications. Besides the conventional catalogue, with detailed information, there was everywhere a free guide with shorter synopsis and the scheduling for all the screenings, with the basic information: film, duration, screen, and page where to check for more data. For each screening there would be a unique number, which would make everything easier when getting tickets, avoiding confusion at the ticket office even if we'd interact with someone that didn't know much English. People that go often to some of the film festivals I've been to can picture how practical the system is, because sometimes you'll get several tickets for several screenings and confusion can arise, resulting on unnecessary time waiting in line. With this system one just had to film a small paper with numbers and give it over the counter. Excluding the Midnight Obsessions, the last screening would be at 8 p.m., being the first at 10:30 or 11 a.m. With screenings at 2.30 and 5, it was possible to watch four films a day, with time for meals or for a coffee. The schedules would also normally allow about 20 minutes for the guests to talk with the audience at the end of the projection. Some films had special "Guest Talk", which meant a wider period, of an hour, for the dialogue between filmmakers and audience. For those ocasions, a table and the necessary chairs would be placed between screen and audience. 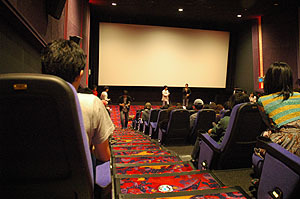 There was translation available for most screenings, and the foreigners would be asked to get together in the same area of the theatre to make the process easy. In more than one occasion, there was someone translating just for me, but there was also some cases were there was no English translation available. That was the case when it was required to translate from Japanese to Korean, for instance. Naturally, in other situations, as when guests used English, there was no need for translation at all, . As for the films, it was very rare for them to lack English subtitles and when that would happen the information would be placed on the festival's notice boards. Korean language is nowadays written mostly from left to right, mas it can also be used top to bottom (right to left; the same would apply to Chinese and Japanese). The Korean subtitles could be projected on a vertical rectangle on the right side of the screen. On a 1.85:1 film the text will appear just outside the image, being superimposed on the wider scope ratio. But even in these situations the interference with the image is minimal (one only notices the rectangle on dark scenes) and that system can be used on international copies with on-print English subtitles. For a given timeslot it was possible to choose from up to nine different screenings. Each screening would be repeated two or three times, on alternative schedules. The resource to an army of volunteers seems to be a very own characteristic of Korean film festivals. The young people in yellow are everywhere: at the ticket offices, at the entrance or inside the theatres, during projection, and even controlling the traffic on the block (the Cinema Street was closed to traffic during the festival). There are a lot of young people willing to be volunteers, and they'll need to apply and be submitted to interviews. Apparently there's some competition. The volunteers were quite attentive to the needs of the more confuse foreigners; every time it was necessary (mainly on the first day), there would be someone to guide us until the screening room or even to show us the place, if we felt unsure about the meaning of the characters for "row" and "seat". Numbers. 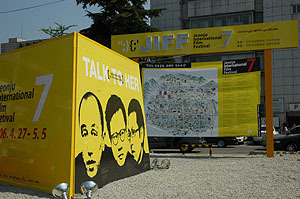 The JIFF had a budget of 2,350,000,000 WON (around 2 million EUR or 2 million, 248 thousand USD) and projected 194 films from 42 countries. The seating rate was 70%, below last years' 79%, but there was an increase on the global audience numbers: 85 000 (including 59 000 tickets paid for), by comparison with the 69 000 in 2005. The international press has not yet a very strong presence on the festival: amidst the 693 accredited journalists only 43 were foreigners. The festival had the help of 263 volunteers. The JIFF was inaugurated on April 27th, Thursday, with the screening of Offside, by Iranian director Jafar Panahi. An hour before the projection was expected to start, a crowd gathered outside to watch the guest walking on the red carpet unrolled into the entrance of the Sori Arts Center. The people, mostly young, would cheer or scream, more or less hysterically, at the crossing of some of their favourite stars, always with a cell phone in hand, ready for another photo. Amidst some familiar faces, there was actor Choi Min-sik (see photo), whom was at the JIFF for a masterclass. 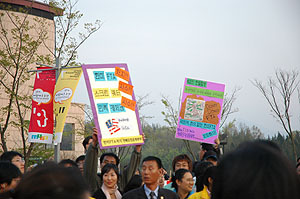 He turned to the group which protested the Free Trade Agreement between South Korea and the US, raising a fist to show his support. Choi has been in the front of the protests against the reduction of the screen quotas for Korean films, from 146 to 73 days a year, expected to have effects after July 1st. The ceremony included music and other performances, before Jafar Panahi went on stage to present Offside. There was no translation to English of the event, hence there's nothing else to comment on.